The field has been cut in half, with some of our picks from round 1 making it on to the conference semifinals, while other great masks got sent packing for summer vacation. With a trip to the conference finals on the line, we’ll now take a look at how the remaining eight buckets stack up against their opponents. 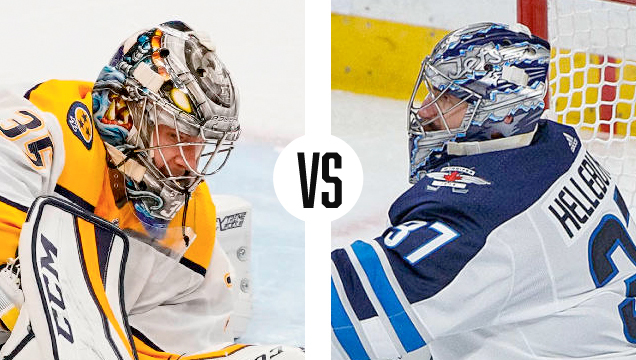 Like always, we’ll be pitting the starting goaltenders’ masks up against each other in matters of branding, composition, and overall aesthetic value. If you missed the first round, catch up here, or keep reading and see which come out on top! 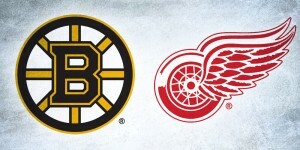 After a grueling 7-game series with the Toronto Maple Leafs, Tuukka Rask and the Bruins are set to take on Vasilevskiy and the Tampa Bay Lightning in a battle of the Eastern Conference’s best. Despite being designed by different artists, the goaltenders’ masks in this series have a lot of similarities, so let’s see how they stack up. Starting the series paired with a home blue sweater, Andrei Vasilevskiy’s mask brings the magic in the form of color changing paint. Painted by Sylvie Marsolais, the strength of this design comes in the artist’s attention to detail and the precise execution. Despite being a busy composition overall, there are some shining moments that stand out, like the smoothness of the lion on top and the mixture of finishes in the paint job. 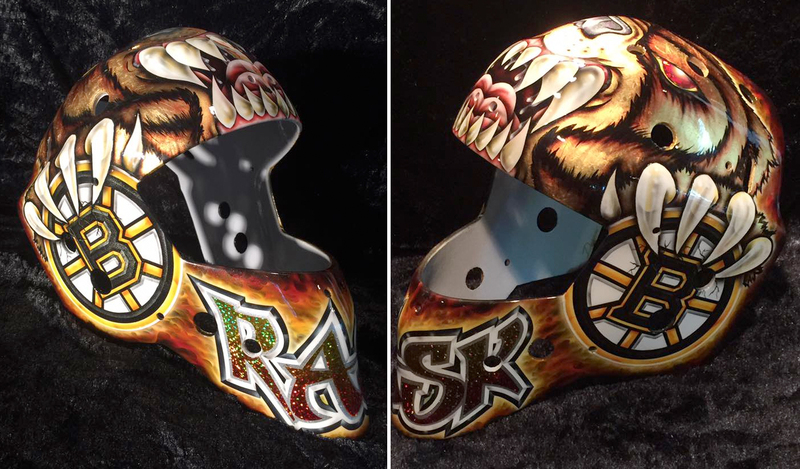 Across the ice, Rask brings the ultimate consistency with his signature demon bear mask. Painted by local artist Ron Slater, this design really shines in the subtle details and textures. With a simple, symmetrical composition of a bear head framed by claws and spoked-Bs, the fine cracks in the logos, shimmer in the bear’s fur and glow of the eyes really take this design to the next level. While there are some really nice moments in both these masks, the dynamic layout of Rask’s helps him edge out his opponent by a narrow margin. Stop me if you’ve heard this one before… in the second round, the Penguins and Matt Murray once again take on Braden Holtby and the Washington Capitals. 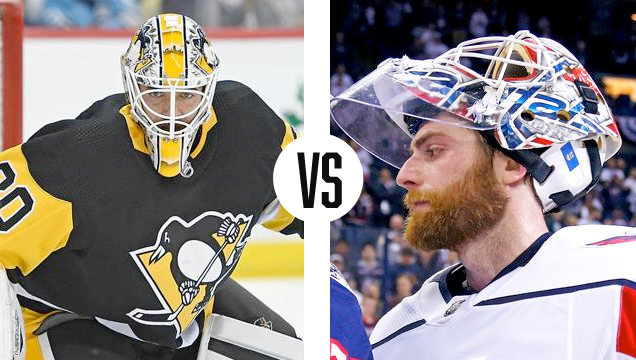 These two teams are no strangers to one another, nor are the goalies, but who comes out on top in the latest chapter of the Pens/Caps mask saga? 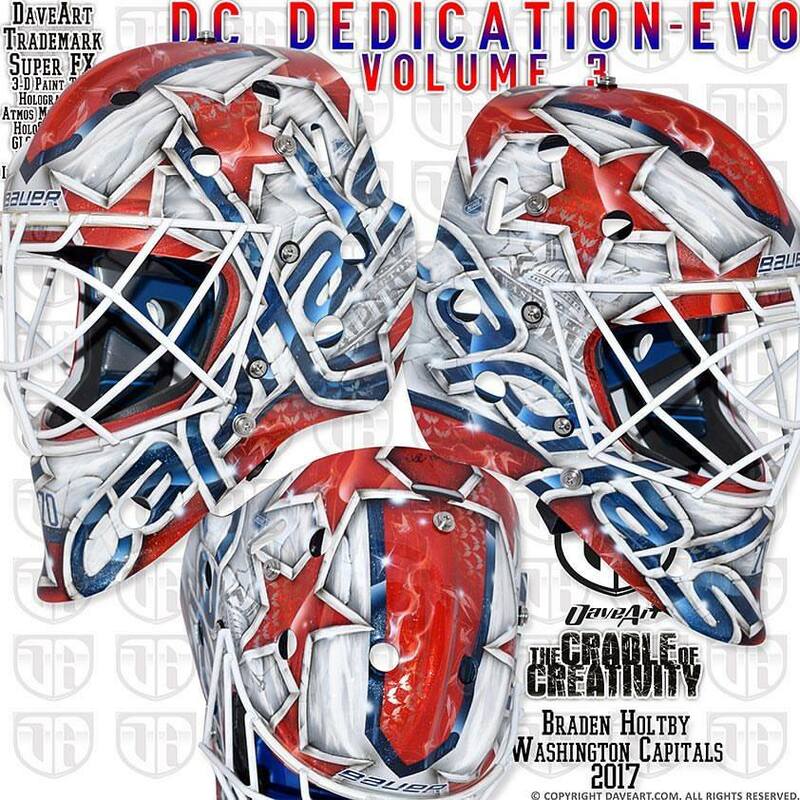 Holtby has been equally as consistent when it comes to his mask, now on the third volume of his “DC Dedication Evo” design. While Holtby’s is equally as simple in composition as his opponent’s, the Daveart special effects give the otherwise generic design some flavor and punch. There are a lot of similarities to these two buckets, but the depth and detail in Holtby’s gives him the extra edge to beat out the Caps’ rival club. 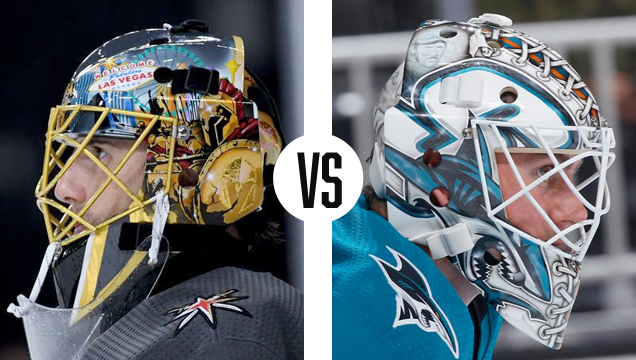 The first semifinal matchup in the west brings us two all-star goaltenders and Vezina finalists whose gear styles couldn’t be more different. 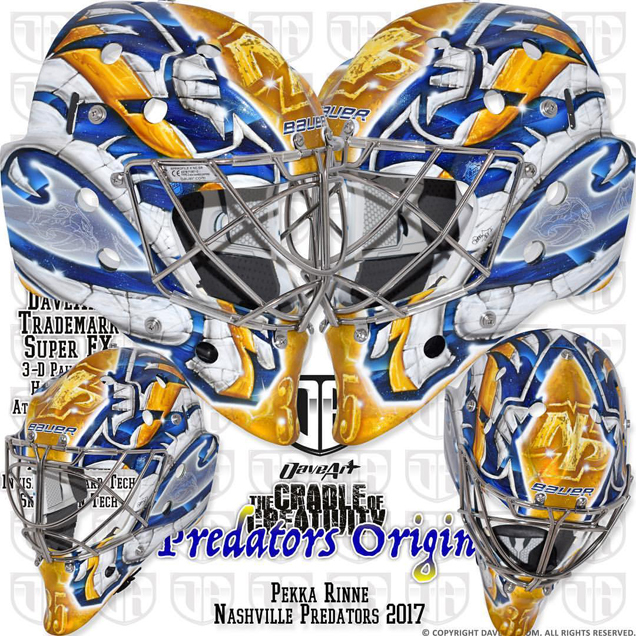 Pekka Rinne, no stranger to the Bucket Bracket Showdown after his appearance in the 2017 finals, switched up his mask for the postseason, abandoning his cleaner, simpler design from the regular season. Going back to what appears to be another Mad Max concept with the Preds’ secondary logo in stone on the top, this is a real bummer of a switch. 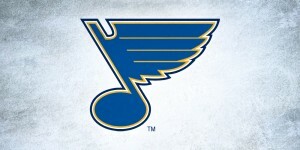 Without a prolonged look at this thing, it’s near impossible to tell what’s going on in the design, and the Nashville brand just gets lost in the shuffle. 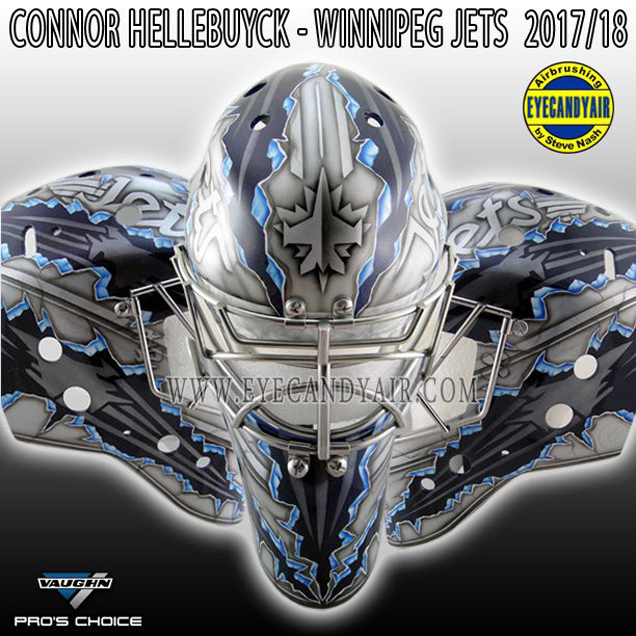 Across the ice, Hellebuyck’s mask does a far better job of creating readability with a balanced composition and smart color play. We’re really into what artist Steve Nash did with this bucket, designing something unique and dynamic, yet still on brand and totally badass. 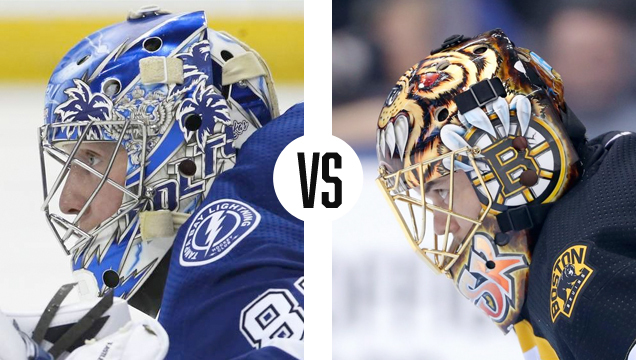 Two goaltenders who are no strangers to the Bucket Bracket Showdown face off in round two. Having each lost their first round BBS series but sweeping their respective opponents in the real series, Flower and Marty go head to head with two very different style buckets. 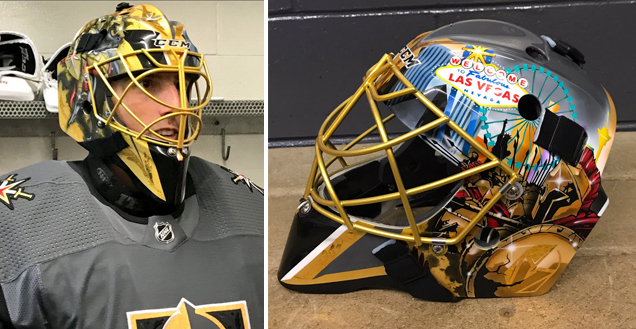 In the Vegas net, Marc-Andre Fleury’s mask captures the gilded whimsy of the Golden Knights’ home city. Despite being a cram-packed composition, the artistry and unique placement of the Vegas logo earn Fleury some bonus points. 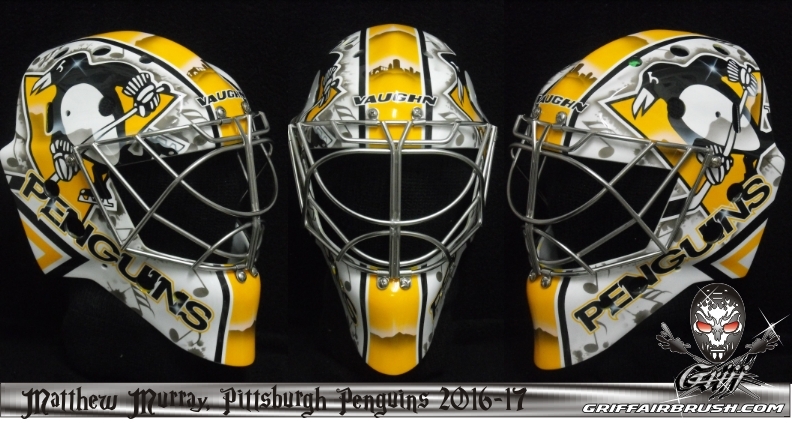 Using the V as a design element to break up the two sides of the mask is a smart play by artist Stephane Bergeron and gives Fleury a bucket that’s outside the box. Is the whole design a little overdone? Yes, but is Vegas itself overdone? Absolutely. Across the ice for San Jose, Martin Jones’ brand-focused bucket has consistently earned high marks in the Bucket Showdown. 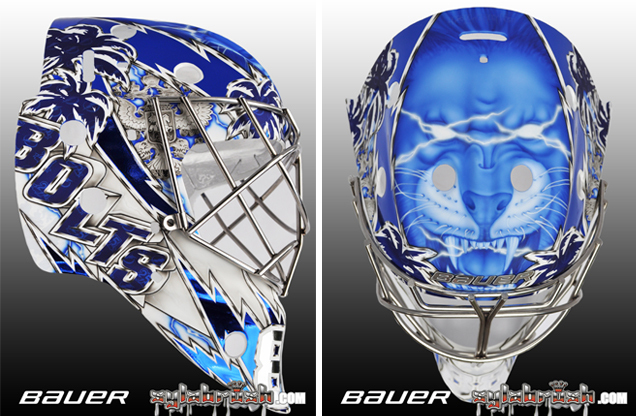 Painted by Steve Nash of Eyecandyair, the shining moment of this mask lies in the smooth airbrushing of the laces up the middle. 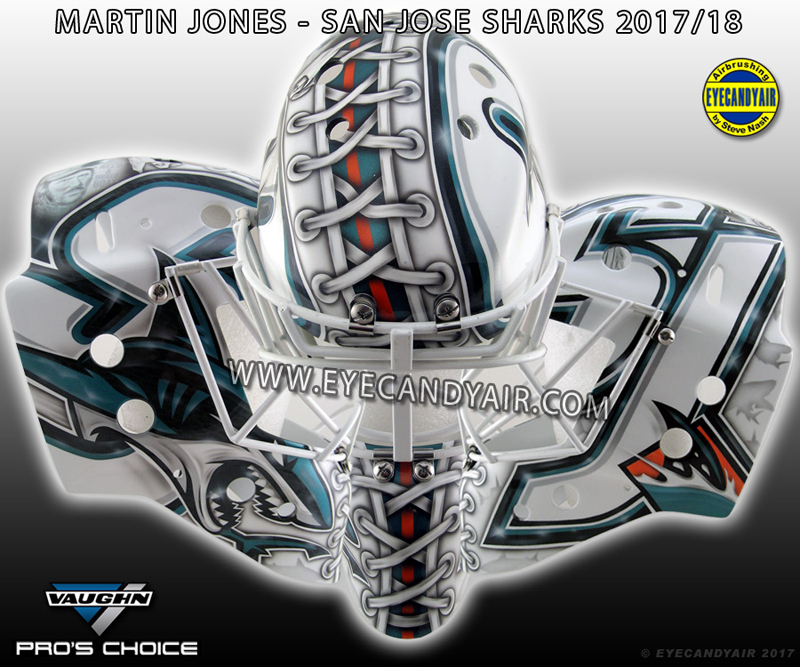 The execution of the design overall is really crisp, from the boldness of the logos on each side to the subtle light flares and shadowy sharks swimming in the negative space, but the balance in the composition and color play really just bring this thing together as a top to bottom standout mask. For that, Jones has earned himself back-to-back sweeps. ICYMI, to help support the community of Humboldt, SK begin to heal after the tragic Broncos team bus crash, we are donating 100% of the profits from our Humboldt Strong design directly to the team. 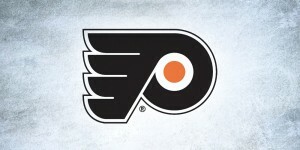 Products will be available for purchase until the conclusion of the second round of the playoffs.